Building a better life through greenways and trails. The environmental, health, economic, and community benefits of trails for walking and riding. Greenways are corridors of protected open space managed for conservation and recreational purposes. Trails are paths used for walking, bicycling and other forms of recreation. 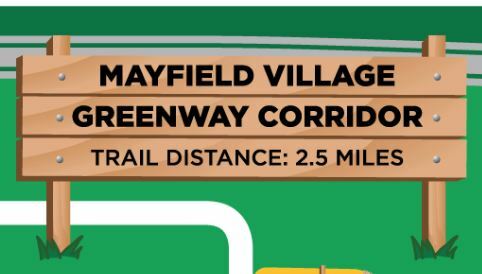 To view the Mayfield Village Greenway Corridor click the image below! Cuyahoga Greenways is a joint effort between County Planning, Cleveland Metroparks, and NOACA to build an interconnected system of greenways and trails that link neighborhoods, parks, and public transportation, and create a comprehensive countywide active transportation network. The greenway system will provide recreation opportunities and alternative transportation options for moving around the county, on foot and by bike, and improving our communities’ health, well-being, and economic vitality. The project team is in the early stages of preparing this network of candidate routes connecting existing trails, parks, and points of interest throughout every community in Cuyahoga County. If you want to take the project survey, learn more about the benefits of greenways, get updates on the plan, or find out where and how you can get involved in the planning process, please visit www.cuyahogagreenways.org for more information.